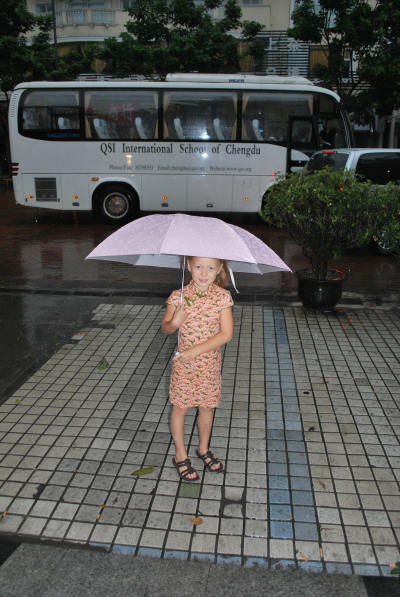 We have been back in Chengdu for about 3 weeks and have official got both kids off to school. Gemma began school on the 21st of August and I am happy to say she still loves school! Her teacher this year happens to be a dear friend of ours and she has 20 kids in the 1st grade class, but she is lucky to only have 10 kids in her classroom. The great thing about QSI is that they have such a great teacher student ratio with no more than 12 kids per 1 teacher and 1 teacher's assistant. As you can see from the photo is was absolutely raining cats and dogs, so I didn't have a chance to get many pictures. She is wearing a new qipao that I just had made at my favorite tailor here in Chengdu, but I found this cute cherry blossom material during my visit to the US this summer. Angus on the other hand Angus wasn't so excited about going to school. Angus' first day of school was today and he is attending a Singaporean School called Eton House. 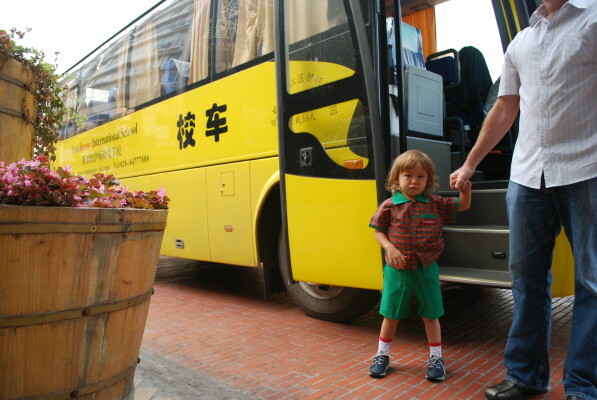 We decided to send him to a Chinese Kindergarten instead of an International program because we were worried that he would lose his Chinese language skills. 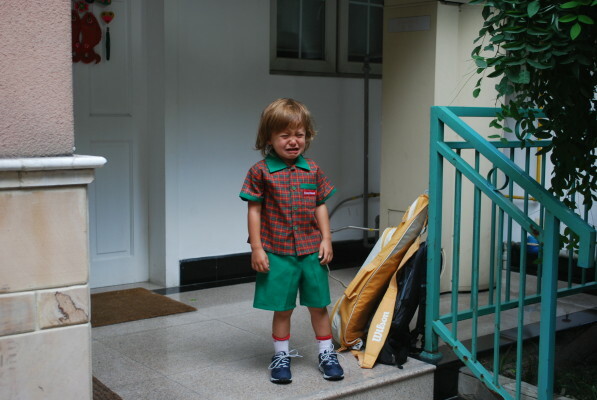 Angus decided that he didn't want to go to school and he definitely didn't want to wear his uniform. After a major struggle of getting him dressed and refusal to eat breakfast we went on our way to the bus stop. Here he is getting ready to get on his big yellow bus. He is still a bit apprehensive in this picture, but much better than the tears of 5 minutes ago. I put him on the bus and there were some tears, but when Jonny and I met him at school a half an hour later he seemed much better. We took him to his classroom and made sure he was comfortable. He seemed to do fine, so we went on with our day. When I picked him up from the bus he was smiling from ear to ear and he is really excited to go back tomorrow!